Catalina Alvarez in an Occupational Psychologist and resides in Spain. She is involved in the WordPress Community through her husband’s work. She has volunteered at several WordCamps in Spain and will be doing the same at WordCamp Europe 2017. Catalina is pursuing her Master’s Degree by performing a survey about the Motivation and Burnout in the WordPress Community. She did an internship at HumanMade and found out that there is very little data available concerning a distributed workforce. Isabelle Garcia is a front-end web developer and social media geek. She is a “Digital Nomad” and travels the world working remotely. She has no fixed base, no office. Isabelle likes to frequent local libraries, not to borrow books but to take advantage of the quiet atmosphere. While other digital nomads meet at coffee shops or co-working spaces, she likes to spend entire days and even weekends in the common areas and desks of public libraries. When I first contacted Isabelle, she was starting a new adventure she called #WCAsiaRoadTrip. She was going to spend 2 or 3 months traveling through Asia and attend WordCamps at Udaipur, Pune and Bangkok. Isabelle records video interviews at WordCamps which she then uploads to YouTube. She uses the VINUBIS Video Editor Plugin to edit her videos. She likes to give back to the WordPress Community by taking part in Translation events with the Polyglots Team. You can see some of her WordPress TV videos HERE. Krystal O’Connor lives near Pittsburgh, Pennsylvania and works at Libsyn, which is a podcasting hosting service. Libsyn has over 2.6 billion downloads and hosts over 25,000 shows with 44 million monthly audience members. Krystal provides technical support, writes and maintains the Libsyn Knowledge Base, produces the video tutorials, manages the Libsyn Tutor YouTube channel, and co-hosts Libsyn Live. She spoke at WordCamp Pittsburgh 2016 with a presentation titled WordPress + Podcasting. Many podcasters turn to WordPress to help build the website that will be the landing page for their podcast show, but did you know there were themes, plugins, and best practices geared directly toward marrying your podcast and your WordPress site? Krystal is very active in the podcasting community and Podcamp Pittsburgh. We talk about podcasting in general, procasters versus podcasters, audio versus video among other things. Robert enjoys creating custom themes as well as looking into WP security. He spends time in the WordPress Support Forums helping with security issues. We discuss WordCamp Oslo, the WordPress Community, speaking and touch on ham radio operations. Jeff Chandler and Marcus Couch host the WordPress Weekly podcast, which covers all things WordPress. They also interview a variety people who make up the WordPress Community. Marcus Couch has been a WordPress developer for more than 12 years. Besides being the co-host of WordPress Weekly, he is the cohost of the WordPress Plugins A-Z Podcast with John Overall. Marcus also helps people plan, develop and implement membership sites at Membership Site Coach. Jeff Chandler launched WordPress Weekly in January of 2008. In that initial episode, Jeff talked about the release of WordPress 2.3.2 and running WordPress locally. He resides in Ohio and has been writing about WordPress since 2007 at the WPTavern. When he attends WordCamps, Jeff can mostly be found taking part in the Hallway Track. We had a great time talking WordCamps and the WordPress Community. I do need to apologize to Jeff and Marcus. This is the first time that I had two guest being interviewed. There are times where you can see that Marcus and Jeff’s face are blocked. I did not realize this happened until I was processing the video. Kathryn Presner is a Happiness Engineer at Automattic where she thrives on helping people get the most out of their WordPress experience. Kathryn gave a presentation at WordCamp US titled “From Shadows to Limelight – How Women Found Their Voice At WordCamp Montreal.” Here she talks about the successful effort to increase the number of women giving presentations at WordCamp. We talk about being in involved in the WordPress Community and how she first became active in the Support Forums which led to her applying for a position as a Happiness Engineer. 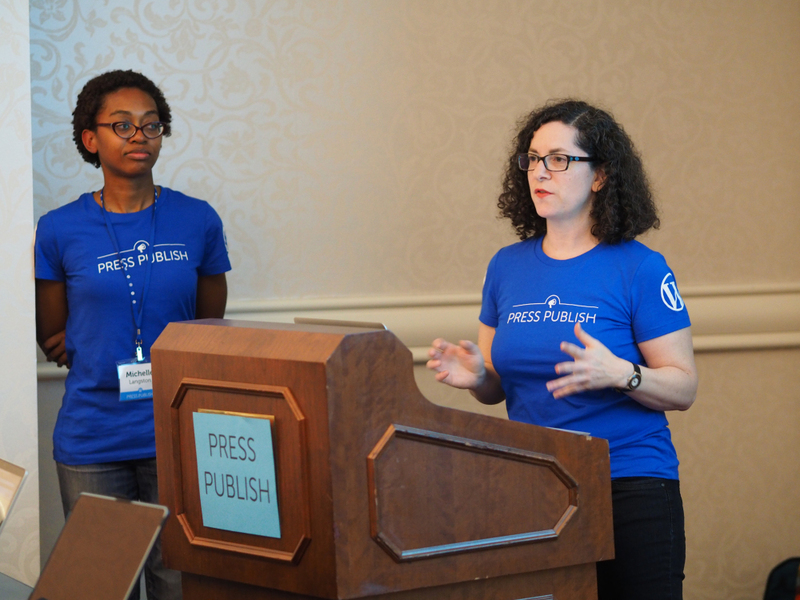 In 2015 Kathryn took part in a brand new WordPress event called Press Publish which made its debut in Portland, Oregon. An initiative of Automattic, the conference mixed advice and inspiration for bloggers with tips on making the most of WordPress. Kathryn is very active in Ladies Learning Code and Girl Geeks. Ladies Learning Code is a not-for-profit organization with the mission to be the leading resource for women and youth to become passionate builders – not just consumers – of technology by learning technical skills in a hands-on, social, and collaborative way. Break down old fashioned social stereotypes. Identify routes around barriers to entry for anyone to get into technology. Encourage and nurture those interested in technology.